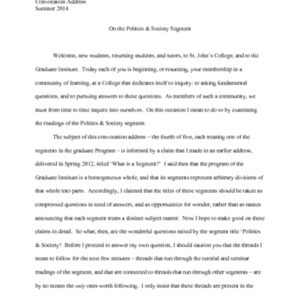 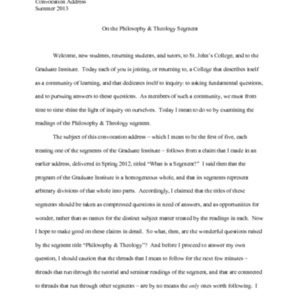 Typescript of the convocation address for the Graduate Institute given by Jeff Black for the Summer 2014 semester in Annapolis, MD. 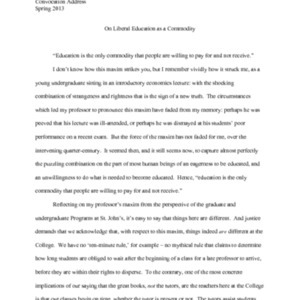 Entitled "On the Politics & Society Segment" in Annapolis, MD. 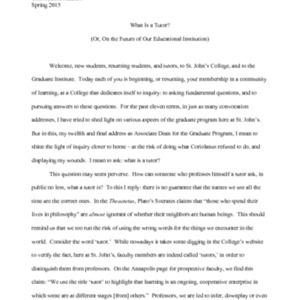 Typescript of the convocation address for the Graduate Institute given by Jeff Black for the Spring 2012 semester in Annapolis, MD. 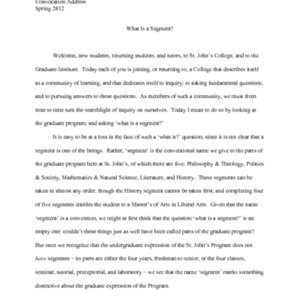 Entitled "What Is a Segment?" 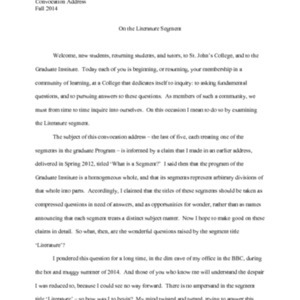 Typescript of the convocation address for the Graduate Institute given by Jeff Black for the Spring 2013 semester in Annapolis, MD. 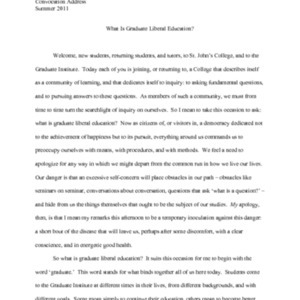 Entitled "On Liberal Education as a Commodity" in Annapolis, MD. 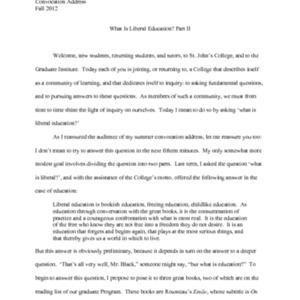 Typescript of the convocation address for the Graduate Institute given by Jeff Black for the Spring 2014 semester in Annapolis, MD. 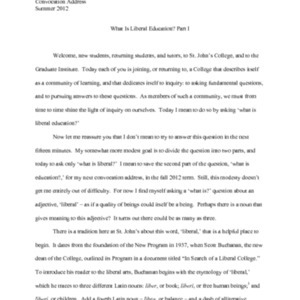 Entitled "On the History Segment" in Annapolis, MD. 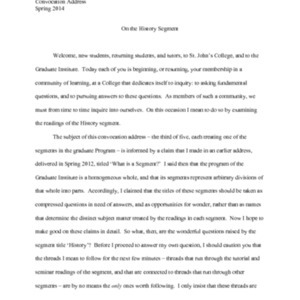 Typescript of the convocation address for the Graduate Institute given by Jeff Black for the Spring 2015 semester in Annapolis, MD. 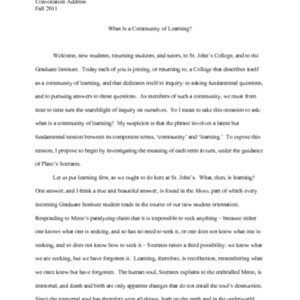 Entitled "What Is a Tutor? 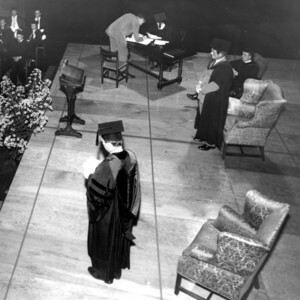 Or, On the Future of Our Educational Institution" in Annapolis, MD. 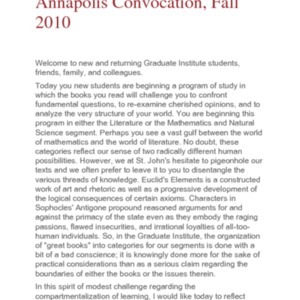 Typescript of the convocation address for the Graduate Institute given by Marilyn Higuera for the Spring 2010 semester in Annapolis, MD. 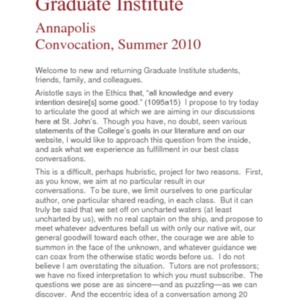 Typescript of the convocation address for the Graduate Institute given by Marilyn Higuera for the Spring 2011 semester in Annapolis, MD. 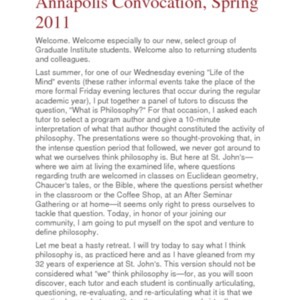 Audio recording of the convocation address given by Pano Kanelos for the Fall 2017 semester in Annapolis, MD. 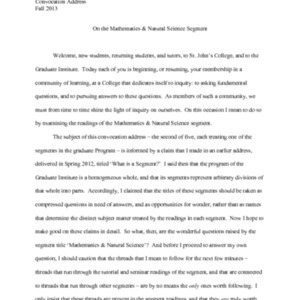 Typescript of the convocation address given by Pano Kanelos for the Fall 2017 semester in Annapolis, MD.